Instructions: Use white card stock to make the card base. Cut card stock measuring 5 inches by 7 1/2 inches and 5 inches by 7 inches. Score at 1/2 inch on the longer side on the bigger card stock. Fold the flap. Apply clear glue inside the flap. Adhere the second piece on this to form a card base that measures 7 inches by 5 inches. Score the front of the card base at 1/8-inch intervals on the scoring board. Distress lightly with peeled paint and faded jeans distress inks. Cut a piece of pattern paper 4 3/4 inches by 5 inches and distress with peeled paint and adhere to the card base using foam tape. Cut a frame from the stitched Rectangle die and distress with Faded Jeans ink. Add a backing of pattern paper of the same design that has been used as the mat layer and adhere to the card front in a tilted manner as shown in the card. Stamp the arrow and the hexagonal images from the collection in chipped sapphire ink. Cut with coordinating die. Colour with Chipped sapphire and faded jeans and adhere to the card front. Stamp the buttons and flowers in purple and blue Archival ink and colour with the same colours using a dauber. Cut with coordinating die. Shape them using the flower shaping mold. Add buttons in the centre. 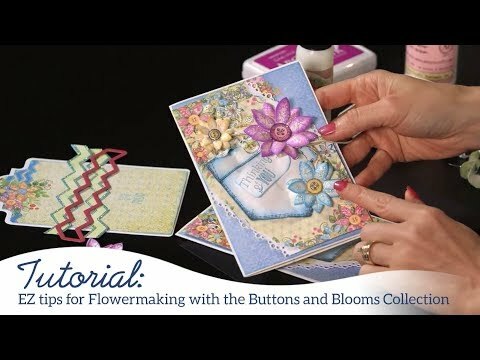 Add the flowers and buttons on the card. Add glossy accents on the button and let it dry. Make leaves by stamping the images from the Leafy Accents stamp set with library green ink on white card stock. Colour using the green Archival inks. 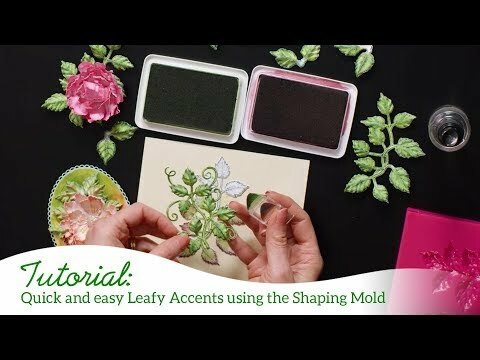 Cut with matching die and shape in the flower shaping mold for leafy accents. Cut a mat layer of the die cut from Ornamental tag die. Stamp the sentiment, add a button and add to the card as shown.